Alright I apologize for the pun. Something different I guess. I'm not sure I could ever really see using one. But I guess it'd be just the thing for dealing with a car jacker or someone trying to mug you in a phone booth. No, thanks. I love my wrist. Didn't realize they were all muzzle loaders, that's OK just load up what you like or can stand.. I tried to order one when Mike Bellivue mentioned it in an article on using percussion revolvers for self defense. The charge to my visa was denied and the bank fraud department contacted me the next day. They thought it strange that my card was used in my neck of the woods one day and then the next at the gift shop at the islamabad int. airport. Then.....I looked in my e-mail trash folder and there was a receipt with an order # just as if the charge had went through. In four to six weeks from 28 Feb. they claim they will complete and ship my diablo side by side pistol. We'll see. B.T.W. the recommended load is 40gr. and 1/2 oz. Last edited by Ray on Sat Mar 09, 2019 5:28 am, edited 1 time in total. No shells involved -- it is a black powder muzzleloader. Those "guncrafters" appear to be severely aesthetically challenged. Even better. I’ve a fair amount of 209’s, BP & shot on hand. with the 40 gr. and 1/2 oz. recommended load, a 2.7 c.c. scoop or a spent .45 colt case will work for both powder and shot. I'm not sure who'd get hurt worse? The bad guy, or the person firing that pistol? It has similarities to the Howdah, but they could make a classier stock offering that was nice walnut, and more like the originals. I would like one, especially scaled down to 20 or 28 gauge. Thread drift, anyone remeber the Sile double barrel BP shitgun with 14" barrels by EMF back in the 70's or 80's. When watson introduces himself in A Study in Scarlet he has just been cashiered and pensioned from afganistan for a jezail bullet in the shoulder. In The Sign of Four he is gimpy and needs a cane for when it is foggy his old wound acts-up. The ever wandering wound is mentioned in at least three other stories. The muzzle flash would blind you. That's why i close my eyes and pull both triggers. 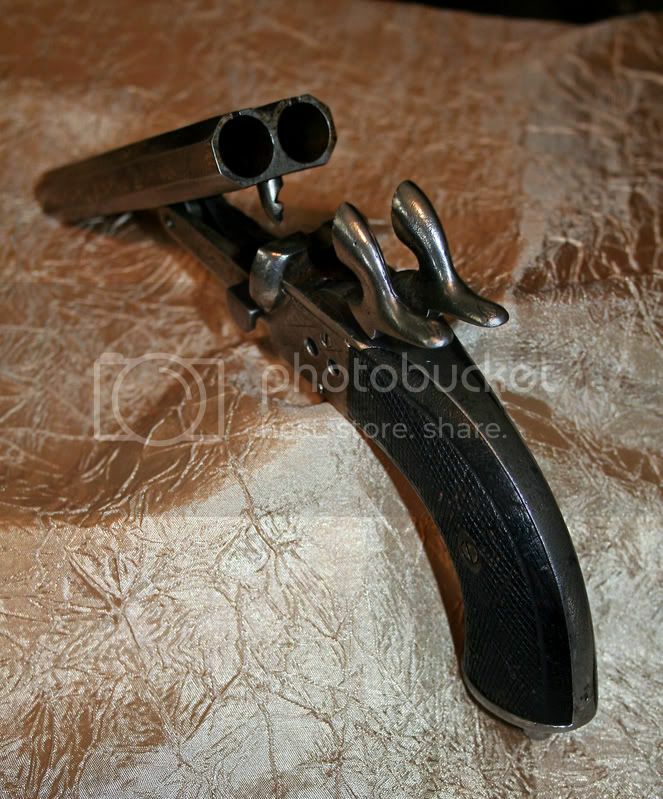 Sorta like this "Boarding pistol I have from the 1840/1850 era. Pin fire 50 caliber something.